Eating on the rooftop of the Four Seasons Hotel always has been a pleasurable experience. Now that Gerard Craft (of Niche, Pastaria, etc.) has taken over the kitchen, it’s a dining trifecta: ambience, food and hospitality. Craft has created a Brazilian-style menu using a wood-fired oven to prepare meats and veggies, including traditional fare like Feijoada and Prawns a la Plancha. He elicits strong smoky notes tempered by classic South American flavorings like orange, cilantro and lime. The redone space feels very ‘now,’ with teal blues and rich camel leather. The former bar and dining room have been opened into each other for a much less stuffy feel. Plus, the outdoor patio has been expanded and from the look of things, it is a popular place for happy hour and just plain lounging (outdoors, when weather permits) with your favorite rum cocktail. South American-inspired cocktails ($11) head the bar menu, including the traditional Caipirinha, made with cachaca, sugar and lime. Cachaca is the most common liquor in Brazil, made from fermented sugarcane juice. The caipirinha is thought to have originated as a home remedy for whatever ailed you, offered as beverages of citrus, honey and spirits for the common cold and more. Cinder House is a winner. The food is interesting and delicious, and the bar area is always hopping. » moqueca: $30; A traditional seafood stew made with coconut milk and some type of seafood broth—in this case, lobster. 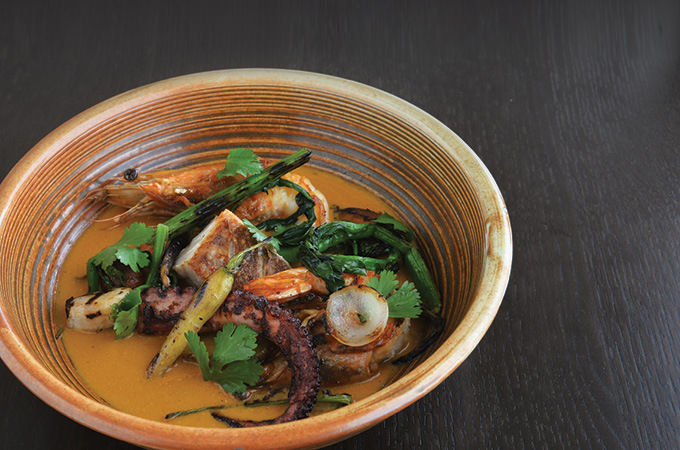 While each item in this bowl of goodies is a treat unto itself (grilled octopus, head-on prawns, pan-seared snapper), the star of the show is the richly flavored broth. » feijoada: $32; This Brazilian stew is another traditional winner, combining pork cuts and sometimes beef with black beans, rice and a saucy base. Craft’s version is perfection, containing soft cheek meat, a slab of fatty belly and pork sausage, along with perfectly braised short rib meat. Orange slices and kale add their own distinct elements to the meat-forward dish. So does a dose of chimichurri, the raw green puree of parsley, garlic, olive oil and vinegar. » piri piri chicken: $28; It’s not all about the sea here. This is a stellar dish of a half chicken, deboned and grilled skin-on with minced garlic. The liberally salted dish was outstanding in flavor and came with a pleasant side of creamy, cheesy polenta, made of manioc instead of corn. » whole fish: $30; This daily special changes. Our blackened Missouri Rainbow Trout came with sugar snap peas and sliced peaches, also char-grilled. » prawns a la plancha: $14; This is a remarkably flavorful starter featuring large, head-on crustaceans drizzled with Spanish sauce. The prawns came topped with large-crystal salt, as did the bread, a country sourdough. » flan: $9; The traditional Spanish dessert is rich and creamy and sits in a pool of caramelized sugar.